UPDATE: Canton introduces your_Duo wireless hi-fi system with £600 starter bundle | What Hi-Fi? UPDATE 02.11.11: Canton has confirmed the release of its your_Duo range of wireless hi-fi components including an introductory £600 starter bundle. The range comprises the your_Duo active speakers, a your_Stick USB transmitter and a your_Dock iPhone/iPod dock. Connect the your_Stick to a PC or Mac and it will stream music from your computer to a pair of your_Duo speakers. While if you want to stream to the speakers from an iPod or iPhone you can dock the device in the your_Dock. The system supports 24bit HD audio and can operate across three zones for a multiroom system. Available now, the starter bundle, consisting of a pair of your_Duo speakers and either a your_Stick or your_Dock, has an introductory price of £600. 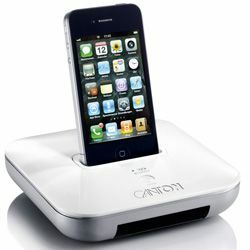 The products are also available individually, with the your_Duo costing £500, the your_Stick £130 and the your_Dock £150. Germany's largest speaker company, Canton, is launching a complete wireless personal audio system here at IFA in Berlin. It's called your_World, and comprises a choice of USB transmitter or wireless iPod/iPhone dock, both able to send music wirelessly, a choice of wireless speaker systems and even a wireless subwoofer. Some of the products – the USB dongle and dock, and a pair of wireless speakers (above) – are due to hit the shops at the beginning of October, and they'll be joined next Spring by an all-in one speaker solution and the subwoofer. The products allow the choice of three radio channels, enabling multiple systems to be run in the home without interference, and selecting these is simplified by colour-coding: the channels are red, green or blue. The range is up to 20m, and multiple receivers – ie speakers – can be used with a single transmitter, or multiple transmitters into a single receiver. The your_Stick unit, seen at the top of this story and expected to sell for £75, is the USB transmitter 'dongle', with 'plug and play' operating with PCs and Macs, and a line-in for additional sources. It's powered from the computer to which it's connected. your_Dock (left) is, not surprisingly, the system's iPod/iPhone dock. In addition to the your_World wireless connection, it has a line-in for external equipment, and line-out to connect to a stereo system. It's powered by an external PSU, comes complete with a remote control, and is expected to sell for £100. The initial speaker offering will be the your_Duo: a pair of powered wireless speakers delivering 2x50W, using bass-reflex tuning and drawing on Canton's extensive speaker knowledge. Selling for an expected £450/pr, they will come in a choice of black or white high gloss finish, and will be supplied complete with a remote control handset. Coming in Spring 2012 is your_Solo (above), a one-box 'mobile active loudspeaker' again offering 2x50W, in a choice of those gloss finishes and supplied with a remote, and the 100W your_Sub subwoofer (below). This has adjustable level and crossover, and like the other speakers comes in gloss black or white. Prices are yet to be set for these last two. Canton products are distributed in the UK by the Digital Home division of Computers Unlimited.